Alternative treatments, such as acupuncture and vitamin supplements have also been found to be beneficial for diabetic peripheral neuropathy patients. These treatments work well as a long-term pain relief therapy. Alternative treatments are also recommended to those patients who are seeking pain relief without the use of prescription medication. Abusaisha BB, Constanzi JB, Boulton AJM: Acupuncture for the treatment of chronic painful diabetic neuropathy: a long-term study. Diabetes Res Clin Pract. 1998;39:115-121. Dyck PJ, Katz KM, Karnes JL, Litchy WJ, Klein R, Pach JM: The prevalence by staged severity of various types of diabetic neuropathy, retinopathy and nephropathy in a population-based cohort: the Rochester Diabetic Neuropathy study. Neurology. 1993;43:817-824. Mendell JR, Sahenk Z: Painful sensory neuropathy. N Engl J Med. 2003;348 :1243-1255. O’Brien SP, Schwedler M, Kerstein MD. 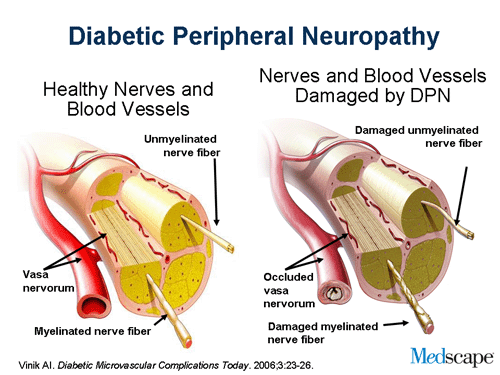 Peripheral neuropathies in diabetes. Surg Clin North Am. 1998;78(3):393-408. 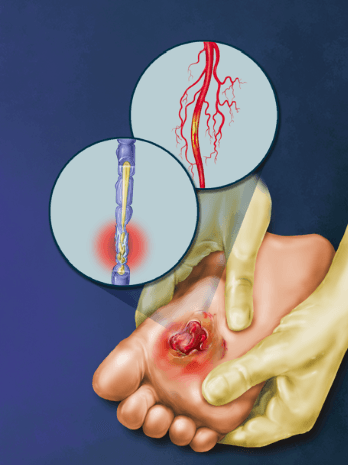 Possidente CJ, Tandan R. A survey of treatment practices in diabetic peripheral neuropathy. Prim Care Diabetes. 2009;3(4):253-7. Skyler JS. Diabetic complications. The importance of glucose control. Endocrinol Metab Clin North Am. 1996;25(2):243-54. Tesfaye S, Chaturvedi N, Eaton SE, Ward JD, Manes C, Ionescu-Tirgoviste C, et al. Vascular risk factors and diabetic neuropathy. N Engl J Med. 2005;352(4):341-50. Veves A, Backonja M, Malik RA. Painful diabetic neuropathy: epidemiology, natural history, early diagnosis, and treatment options. Pain Med. 2008;9(6):660–674.